Freeview platform manager Digital UK has promoted the forthcoming local TV channels for Scotland and Wales for the second time in five days. On the 1st August, local TV stations Made in Cardiff, ETV and GTV - which are due to launch next year, alongside any forthcoming "phase 2" local stations - were promoted from channel 45 to channel 41 following the removal of Sky Sports 1 and 2 from the platform. Today, these channels were reassigned to channel 34, following ESPN's removal. This still puts the channels much lower in the listings than their forthcoming English and Northern Irish counterparts, who have been assigned Freeview channel 8, which is already taken in Scotland and Wales. Further channel promotions would only be possible if channels lower than 34 on Freeview closed or if legislation was passed forcing Digital UK to allocate a lower number. This now paves the way for an existing or new Freeview service to be assigned channel 41 nationally. Keep Dropping!! - 26 may as well come free now. PSB commitments should be ahead of TUTV! 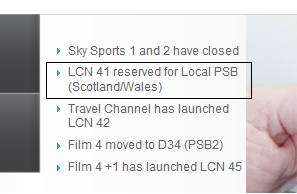 Until TUTV decides where its heading Digital UK should be thinking how about we move Gold (TUTV) to 34 unless UKTV has the rights to 26 therefore may be more reserved surrendering the LCN number. Aside from Welsh and Scottish Local TV being promoted for the third time only C5 sister stations as an PSB should make an claim as they in the 30s and for many deserves the slot ahead of giving promotions of PSB "+1"s! Local TV channels are defined as being public service broadcasters and public money (via the licence fee) is being used to set these services up. Therefore local TV channels require prominence in the channel line-up.